Colourful markets are front and centre of the Chinese way of life, and most people won't buy their daily cooking supplies anywhere else. 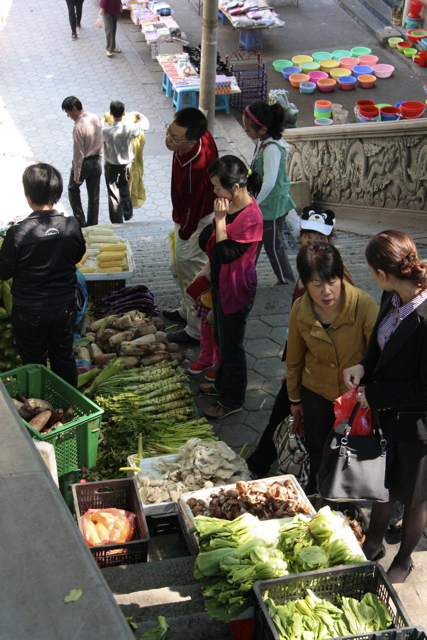 Supermarkets are plentiful, for sure, but nothing beats a street market or wet market for absolute freshness. Why make a special trip to the supermarket when you can easily get what you need, every day, on the way to or from work? 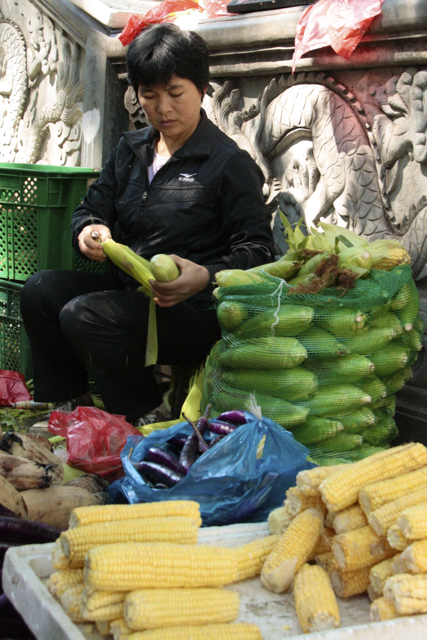 In Qian Dao Hu township, the market stretches all the way up and down these imperial carved Dragon Stairs, with wares spread out in baskets, crates, and on tarpaulins. Today the corn (dark gold, pale gold, and white) eggplants, and lotus root are looking great. The Dragon Stairs wind down through the town past loads of kitchenware shops selling steamer baskets, claypots, earthenware bowls and glass pickle jars. I had a ball - and although I would have loved to buy some mushrooms and lotus root, I'm staying in a hotel with nowhere to cook, so instead I bought a tin vegetable peeler, a rugged home-made grater, a 3-tier tin and bamboo steamer, and some serving spoons. Much hilarity all round at what the crazy foreigner might be needing a 1 yuan (16c) vegetable peeler for.